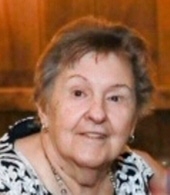 Marlene C. Kieszkowski (nee Wegrzyn), age 77, a resident of Plainfield, IL for 12 years, formerly of Chicago, Bolingbrook and Aurora, IL, passed away on Tuesday, January 22, 2019 at Seasons Hospice Home in Naperville, IL. She was born September 7, 1941 in Chicago, IL. Beloved wife of the late Edward S. "Ed" Kieszkowski, whom she married December 7, 1963 at St. Christina Catholic Church in Chicago and who preceded her in death on October 9, 2016, loving mother of Deborah (Kevin) Rehder of Plainfield, Colette (Jason) Corriveau of Oswego, IL, Michael (Erin) Kieszkowski of Plainfield and an infant son, the late Daniel Kieszkowski, adored grandmother of Hannah and Justin Rehder; Matthew and Thomas Kieszkowski, devoted daughter of the late Louis and Mary Wegrzyn, dear sister of Louis (Karen) Wegrzyn and Kenneth (Susan) Wegrzyn, sister-in-law of Joseph (Joyce) Kieszkowski of Stilwell, KS, Norbert (Lynne) Kieszkowski of Naperville and the late Linda Kieszkowski, fond aunt, great-aunt and friend of many. Marlene grew up in Chicago's Lawndale neighborhood, attended William Penn and Eli Whitney Grade Schools and was a 1959 graduate of Lucy Flower High School. Marlene worked as a tailor for many years at J. C. Penney in the Fox Valley Mall, Aurora, IL. She was a member of St. Mary Immaculate Catholic Church in Plainfield and enjoyed crafts, sewing and spending time with her grandchildren. Visitation Friday, January 25, 2019, 4:00-9:00 PM at Overman-Jones Funeral Home & Cremation Services, 15219 S. Joliet Road, (Corner of Rts. 59 & Rt. 30), Plainfield, IL 60544. Services will begin Saturday, January 26, 9:00 AM from the funeral home and will proceed to a 10:00 AM Mass of Christian Burial at Holy Family Catholic Church, 600 Brook Forest Ave., Shorewood, IL. Interment: Resurrection Cemetery, Justice, IL. To send flowers or a remembrance gift to the family of Marlene C. Kieszkowski, please visit our Tribute Store. "Email Address" would like to share the life celebration of Marlene C. Kieszkowski. Click on the "link" to go to share a favorite memory or leave a condolence message for the family.